We are climbing now, too. Behold the triumph of Inara, who was called “the girl who will never walk” but who decided to be a fierce and all-devouring dragon instead of that. We’re now fairly sure that Inara has CP (cerebral palsy). We’re also completely sure that she is unstoppable. FALL 2016: THE BIG UPDATE! That’s right. We were once told that Inara wouldn’t survive her first year. We were once told she would never stand. We were told she would never walk. She is now taking tentative unassisted steps and lots of assisted steps. Over a year seizure-free and ready to take on the world. And, with a little help from her wheelchair, exploring the world. Girls in wheelchairs explore the world, too. Especially this one! Inara is partially blind, with scarring in her brain and a history of severe seizures. She is also one fierce, dragon-hearted little girl. She is named for a character from Firefly who approached all things in life with both grace and intensity; nothing keeps Inara down, and in our home, she is triumphant. Readers who are new to my work have asked me lately about Inara, and I thought I would collect the pieces of her story here. 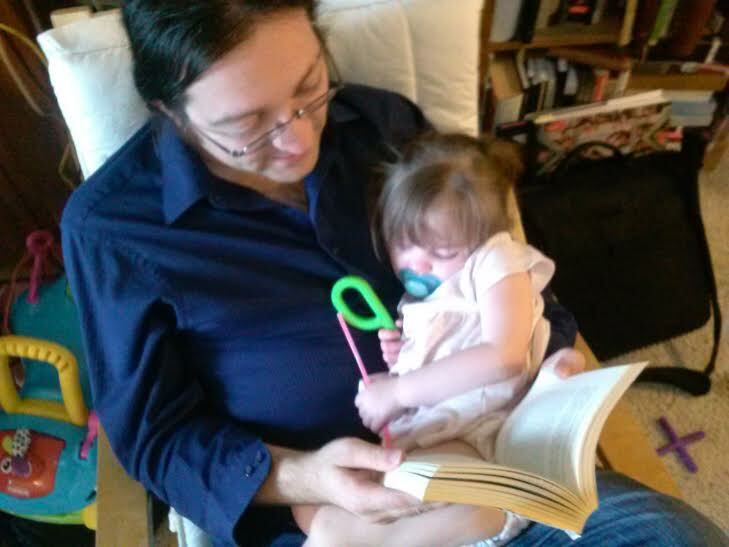 Today, as I update this blog — today is December 29, 2015 — Inara is growing more able by the week. She has been seizure-free for some time; we hope to keep her so, though we know each month is a new creation. Yet we are so inspired by her. Though she isn’t speaking yet, she has developed a deep vocabulary of nonverbal communication — both gestures and sounds — and she can communicate her needs and feelings. She is artistic, painting with her hands and feet. She is standing (at one time we were told she would never stand) and taking a few assisted steps; we are confident that sometime in 2016, she will be able to do at least some walking. She has more fine motor and problem solving skills now. She is tempestuous, capable of fierce tantrums and fits of uncontrollable giggles. And she is smart. Dear readers, she is so smart. I am so proud of her. As they say on Firefly: Inara has done the impossible, and that makes her mighty. I am so proud of her and her sister. And also so grateful for all those — readers, friends, doctors, nurses, specialists, church members, fans and Patreon members — who gathered around us when things were touch-and-go. You all made an enormous difference. I wrote down a lot of what I felt as a father during the dark season. In 2015, I released that memoir as Lives of Unstoppable Hope. I’ve been told that the book is inspiring; a pastor in Oklahoma ordered copies for his entire church. Though the framework for the book is a study of the Beatitudes in ancient Greek as a way to explore “hope,” I’ve been told by a diversity of readers — religious and atheist alike — that the book was inspiring and moving. Lives of Unstoppable Hope is the story behind all the stories I have written. I will certainly pray for her. Tried pre ordering but amazon uk won’t let me at present, will try later. Thank you for sharing this with us, it must be difficult for you and I cannot begin to imagine how you and your wife feel. But I can say that through this blog, and Facebook you give us; your readers a glimpse of who Inara is and who you are as an entire family. I can only be both thankful and honored to be part of a team of warriors such as you, your wife, your daughter River but specially Inara, the girl with an amazonian soul, and the strength of a mighty giant. I will do what it is in me to support your books, your blogs and your page. I believe through the energy of your dear cyber friends we can generate enough good vibes, and good deeds and channel them towards the rebirth of your little warrior’s health, like a phoenix that comes back from ashes. Our prayers, good thoughts and meditation will be for you and those whom you hold dear to you. It means a lot to us — the support, and the encouragement! Little Inara is indeed a warrior. Her middle name (cahira, Irish for warrior) was well-chosen! Thank you for your voice of support and strength for my family! My thoughts and prayers go out to you, your family and especially Inara! I know what it’s like overcoming tremendous adversity and it sounds like this little girl has a heart of gold, the strength of a lion and the tenacity of a wolverine. I broke my back at the age of 22, paralyzed from the waist down, told I would never walk again. Pishaw I said to the doctors. Five years later I rose from my wheelchair, forever to use a cane, but happy for what I had achieved. I’m 59 now with 23 back surgeries to my credit and a full spine plated and screwed together. The most important thing I credit to my recovery is optimism and extroversion. Little Inara has a whole life ahead of her to prove the naysayers wrong. Good luck young lady! You too can win with a strong family, a positive mind and the belief that anything is possible if you believe.